Are you breaking out your supplies for your annual spring clean? You’re not alone! According to one survey, over 75 percent of Americans take part in spring cleaning every single year. Unfortunately, toxins are prevalent in this world, especially in harsh cleaning chemicals. The good news is that you can take steps to reduce the number of toxins you are exposed to by carefully reading labels. Look for ‘green’ products that list all their ingredients on the label and are certified by an independent organization. For any products that have “danger,” “poison,” “warning,” or “caution,” on them, verify whether you should take extra measures like wearing a face mask or gloves when you use them. Your best bet is to also open windows when cleaning with chemicals to increase ventilation and prevent symptoms of overexposure (like headaches, dizziness, etc). 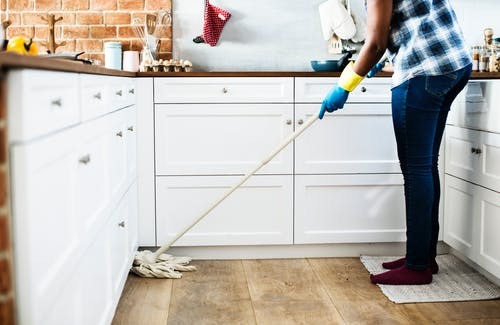 While a good vacuuming or dusting can go a long way towards improving the aesthetics of your home, if you really want to kill all the micro-germs that infest everyday household items, you’ll want to go a step further. Spring is a great time to steam clean carpets and rugs as well as sanitize mold-prone areas like the shower curtain and tub with a bleach and water solution (1 cup of bleach per gallon of water). Check batteries and test each smoke and CO2 alarm in the house to make sure they are all functioning correctly. And while you’re at it, take extra fire prevention steps like removing fire-starting vegetation and debris away from around the house and garage (think brush, newspapers, etc.). Don’t forget to check that your fire extinguishers aren’t expired too! As sneeze-inducing spring allergens start to swarm the air, now is the perfect time to replace old filters in your air-conditioning and furnace units. Don’t forget your fridge as well! You might be surprised to see how much gunk ends up covering your condenser coils. Vacuum or dust them off if you can easily access them (consult your refrigerator manual). Bottles and blister packs and boxes, oh my! A medicine cabinet that hasn’t been sorted in a long time can be a daunting undertaking. It truly benefits your entire family though to get rid of old and unused prescriptions as well as expired over-the-counter drugs. When getting rid of medicine, don’t just throw it in the trash or down the toilet. Look for disposal instructions on the drug label itself or consider dropping it off at a safe drug disposal location. A good way to end up managing a bad ankle sprain or laid up with back pain is to try and reposition or completely move heavy furniture without assistance. Experts recommend organizing your spring cleaning projects ahead of time and preparing for transporting large items. If you know you want to tackle the living room on Saturday and get rid of furniture or at least move it to vacuum under it, ask a friend or family member ahead of time to come over to help you. While you may quickly fill up donation bags with old and never-used clothes, don’t forget about all the other helpful things that you can donate to eliminate clutter in your home and potentially help someone else out. Check with your local Council on Aging or other elder resources organization to see if they accept gently-used medical equipment, i.e. canes, walkers, crutches, shower chairs, etc. You can also donate old exercise and sports equipment you’re not using to a charity re-store. When was the last time your kitchen sponge or cutting boards got disinfected? How about your telephones, remote controls, garbage bins, reusable grocery bags, and other commonly touched items like cards in your wallet? Germs can live on pretty much anything and so often the most commonly used household items go the longest without being disinfected. Make sure to add the little things to your spring cleaning ToDo list for a cleaner and healthier home. Spring cleaning experts agree that the best way to set about deep cleaning your home is piece by piece. Start small with one room or one area first and work your way through a little bit at a time. Be smart about the cleaning products you use and don’t forget to stay hydrated, take frequent breaks, and be mindful of over-exerting yourself.